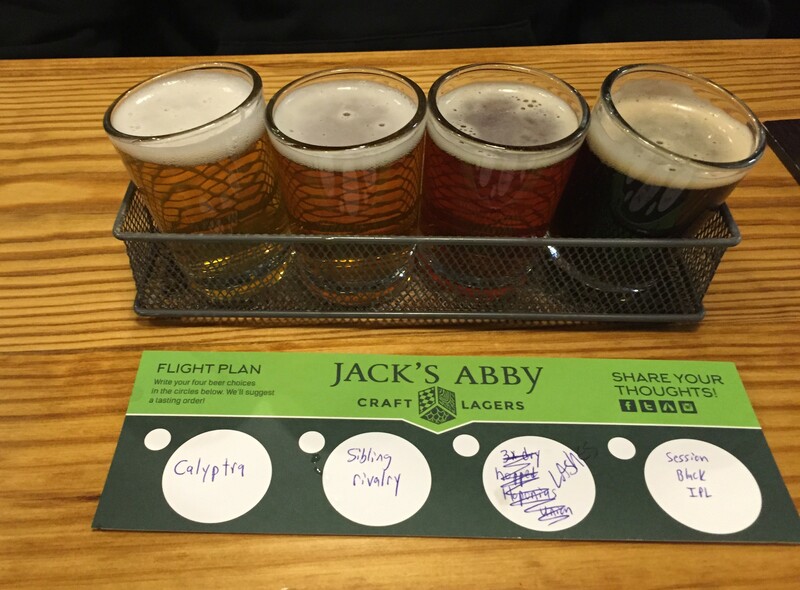 Jack’s Abby Brewing, Framingham, Massachusetts – Breweries, Wineries and the fun in between! 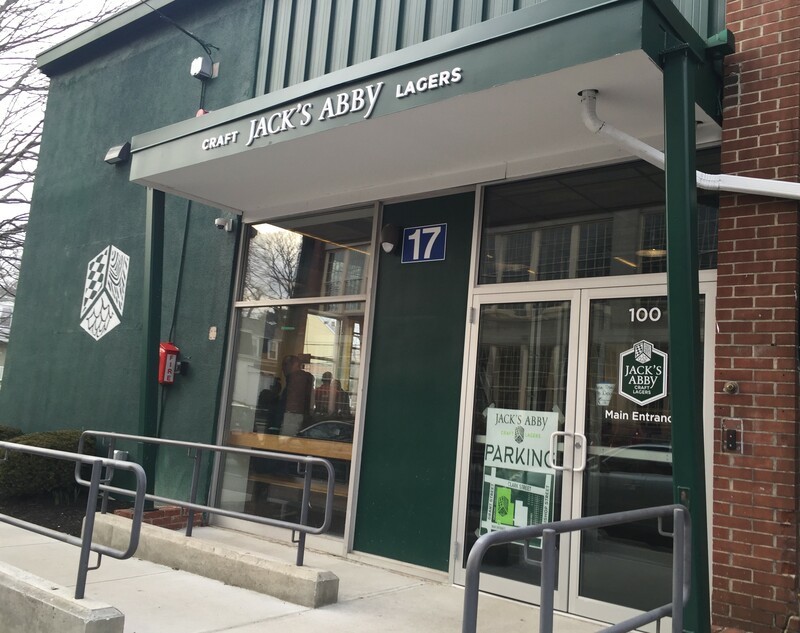 We have been to Jack’s Abby Brewing in Framingham several times, and picked up their beer in Massachusetts’s packies even more. We went back recently to visit their brand new facility at 100 Clinton Street in Framingham, MA with Mark’s brother Jason and sister Michelle. 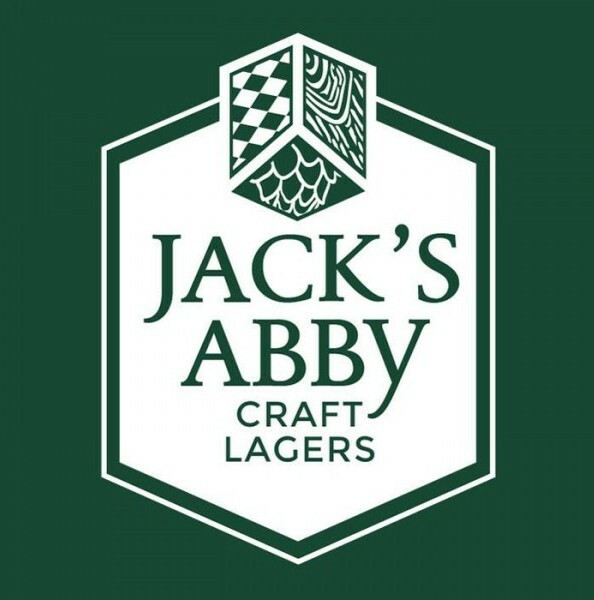 Jack’s Abby opened in 2011. They are an all lager brewery, which is very unique, and means they use only lager yeast. 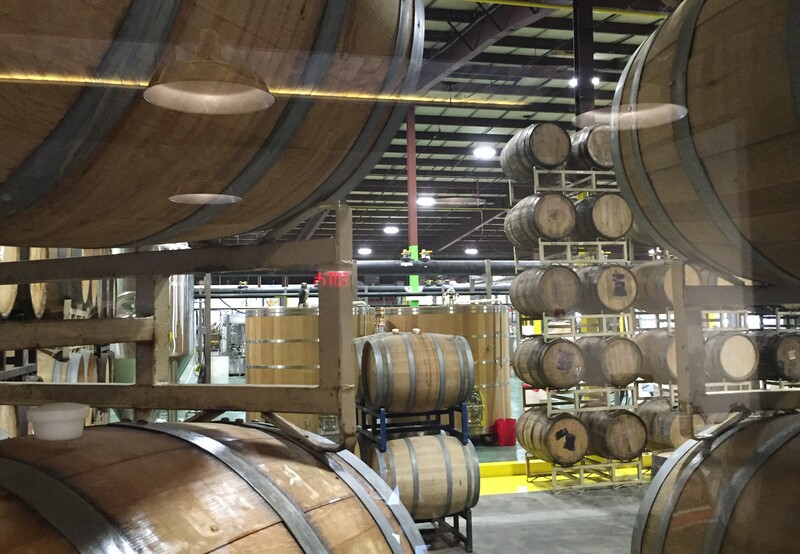 This is a slow fermentation process, much longer than making ales, and they ferment cold. It is a longer process but you have more control over flavoring. 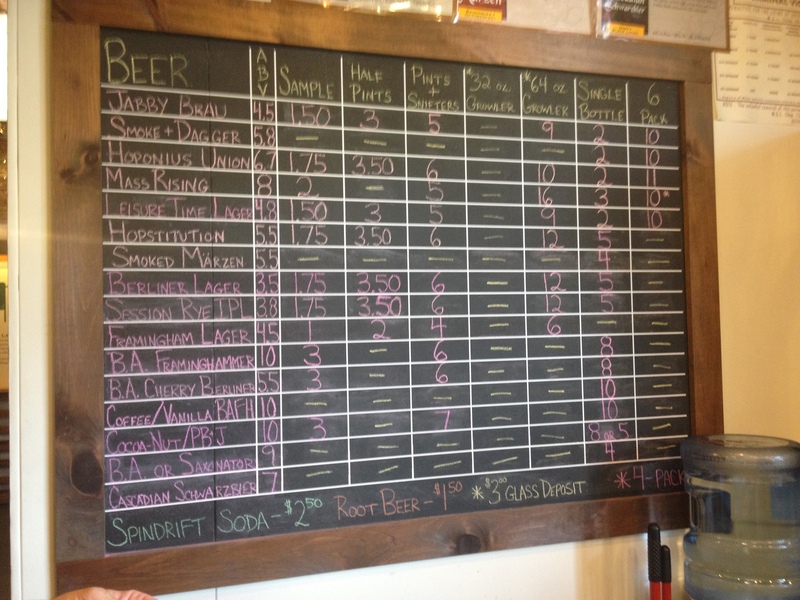 Sugars and yeast cell counts are measured throughout the fermentation process. 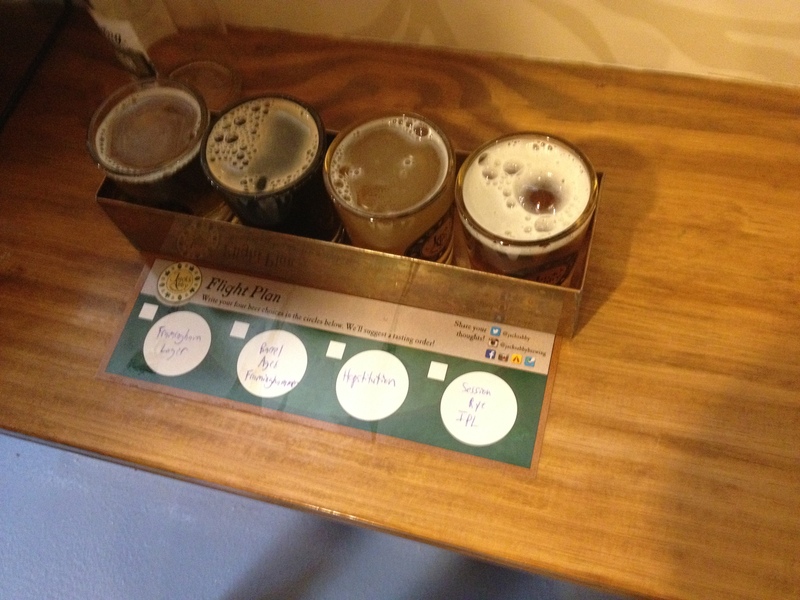 There is a 4 to 5 week turnaround for 1 beer, where ale’s typically take 2 to 3 weeks. 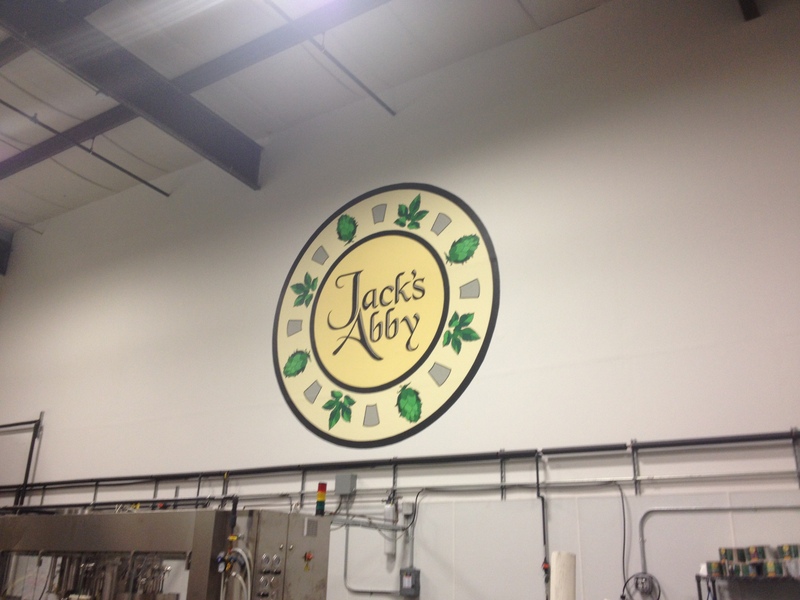 They purchased a new bottling machine in the Fall 2013. They bottle approximately half and keg about half of the beer they make. 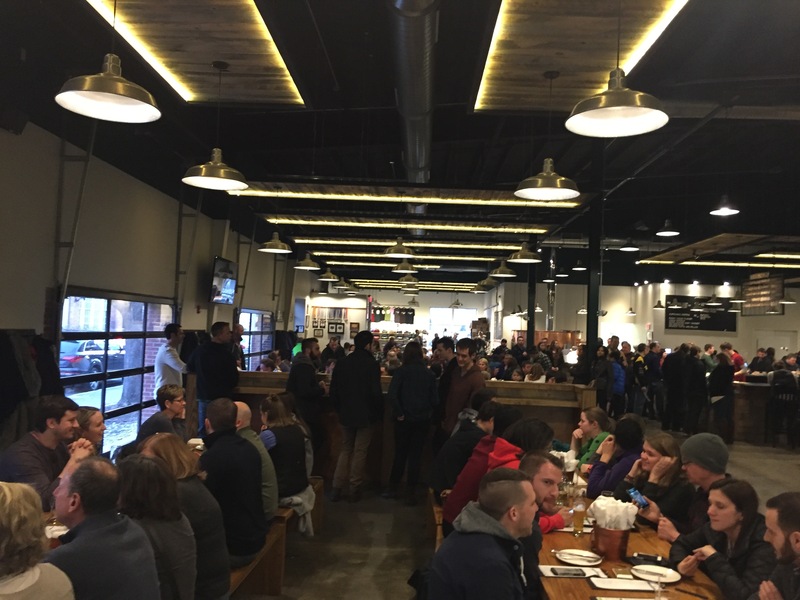 75% of what they make is consumed within the greater metro west area of Boston. They just started canning at the new brewery as well, in 12oz cans as well as 16oz cans for 4 packs. Mark and Jason both buy this beer semi regularly. It is a double india pale lager, or DIPL. It is pretty hoppy, somewhat bitter but a well balanced and smooth ipl. A brewery only release, very tasty, a really smooth beer, probably a combo of the lager base and the addition of the lactose. A good, smooth baltic porter for 10%. Still a strong, dark beer, but well balanced and flavorful. You get sour and wheat flavors from this, just ok but not a stellar sour, according to Mark. 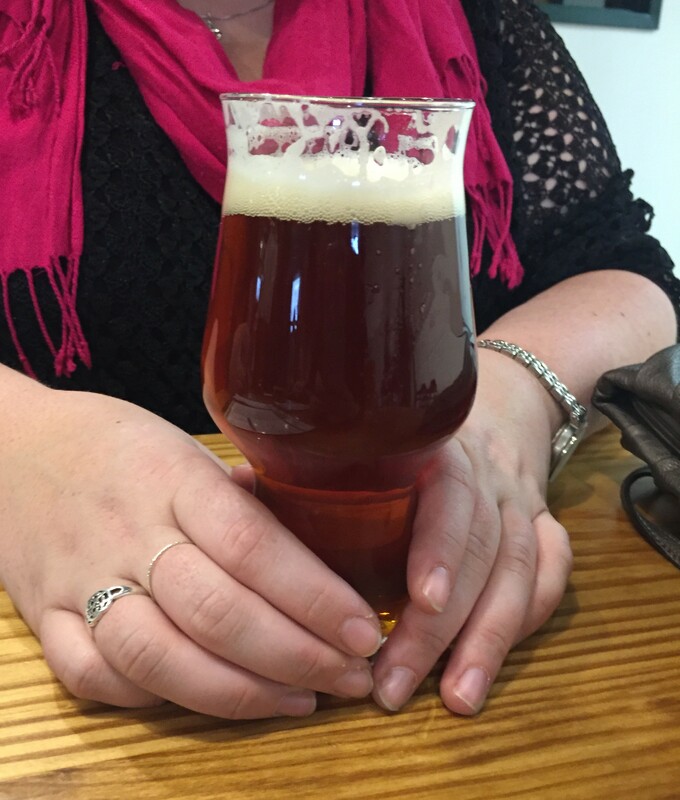 A brewery only release, Megan described it as joy and sunshine, not very descriptive, we know. Mark was hoping it would be a little bit better, not enough blood orange fruit flavor. 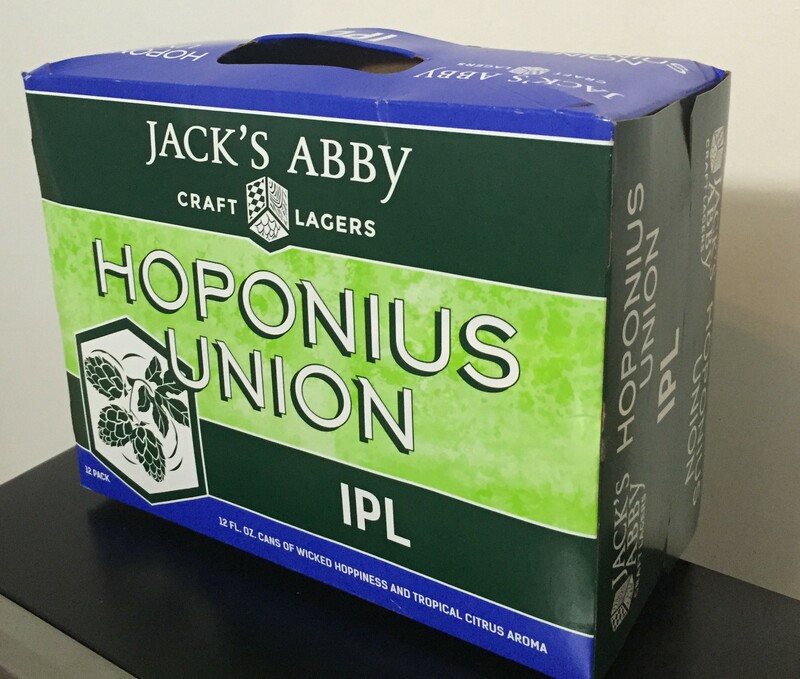 Pretty good overall IPL, not lacking in flavor for a session lager. They are releasing 12 oz cans of this soon. Really good, smooth for a double. Really good hop flavor and overall balance. Michelle got a pint of this beer, which she enjoyed. 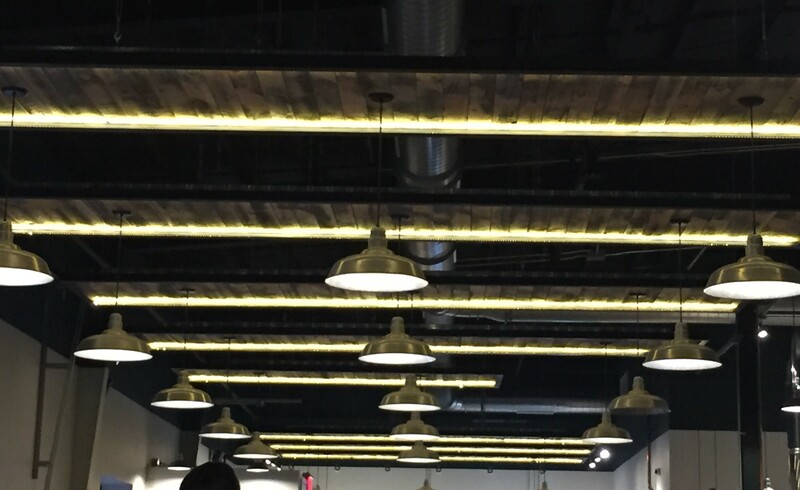 One of the reasons we wanted to visit the new facility is that they have a new beer hall and they serve food. 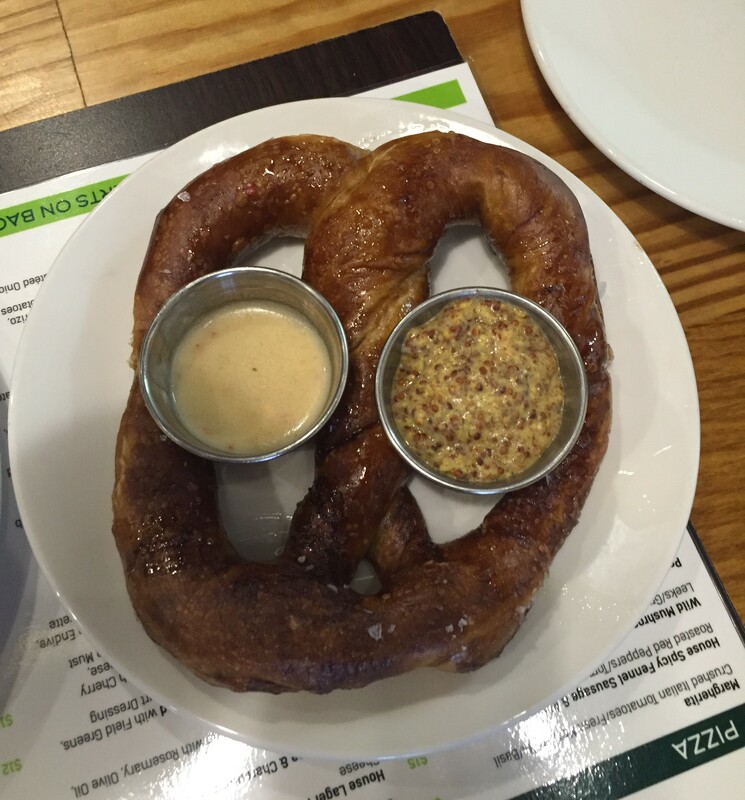 We got 2 pretzels for apps that were very tasty (that’s just one in the picture). 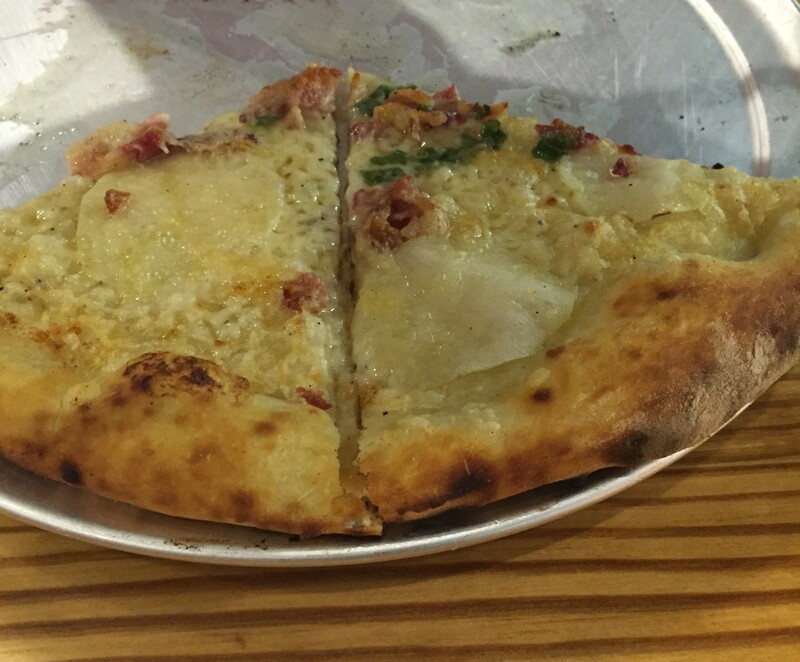 Potato and Bacon pizza, pretty good. 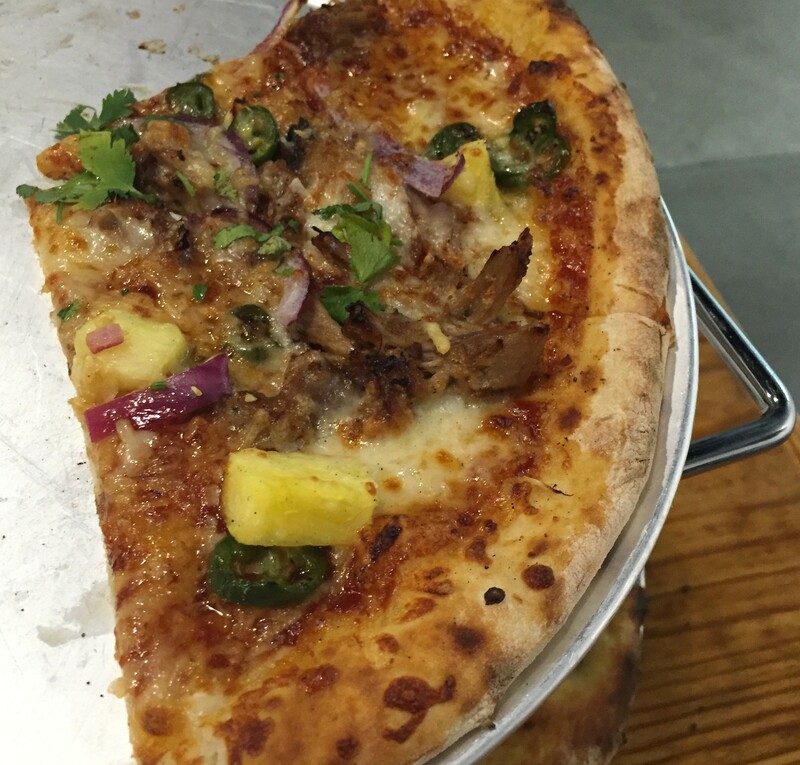 pineapple and serrano chili, and BBQ pork. When we visited it was only around 4:00, so we weren’t quite ready for dinner, we just got a few pizza’s. They were good. 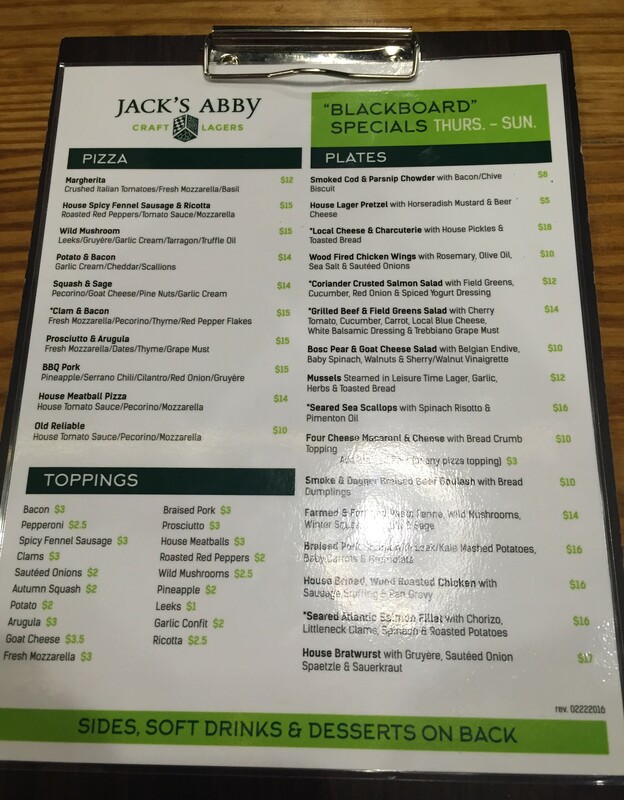 Their menu is not that big, and they don’t have everyday bar food, no burgers or sandwiches on the regular menu. big barrels in the bottom picture? Must be something tasty in their! 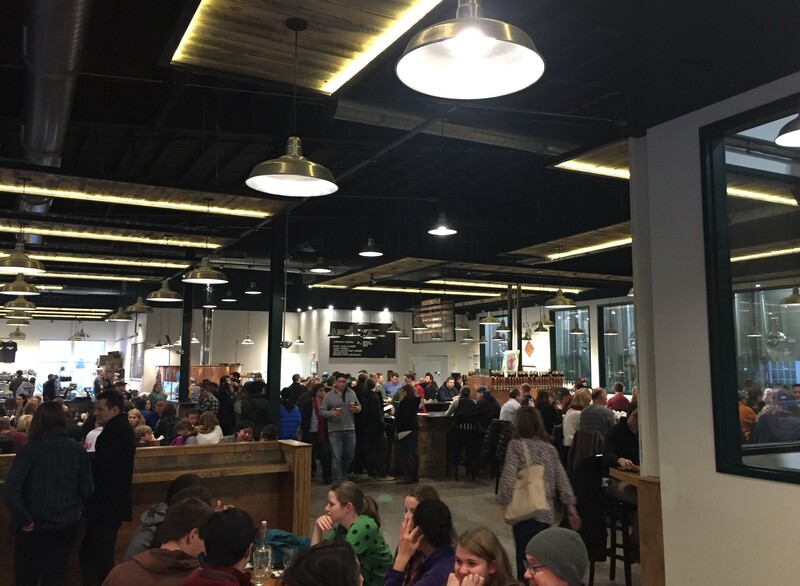 They have a much, much larger tasting area, or beer hall, now. It seems like it might not be quite large enough for the popularity they have achieved. We tried to visit a month ago, at around 7:00 on a Saturday. Couldn’t find parking or even get in the building it was so crowded. Even at 4:00 or 5:00 on a Saturday this is how crowded it was. Luckily we got a seat at one of the longer picnic tables. 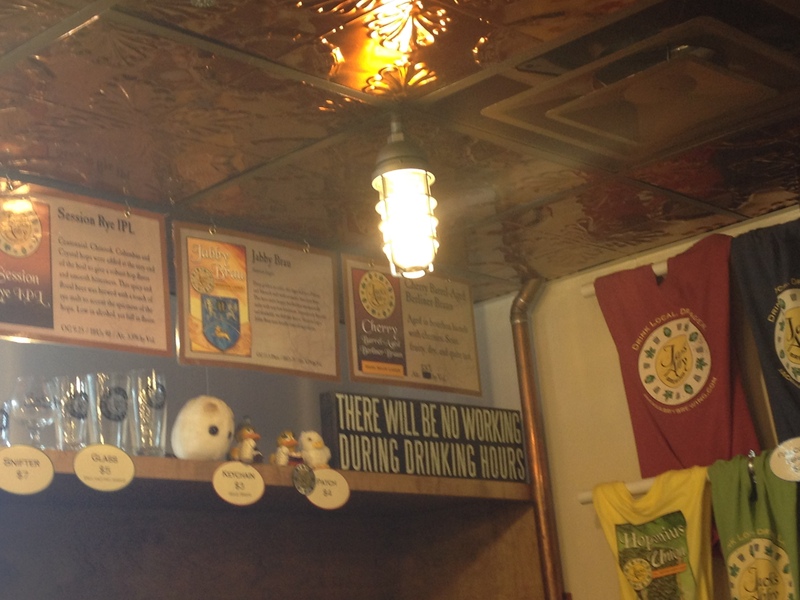 Unfortunately, they operate the beer hall as seat yourself, which probably adds to the crazyness on busy nights. It looks like they need more room already. cooler in person, the picture doesn’t do it justice. We were glad to see they do have a separate bar area, when you first enter, for beers to go, bottles, cans, growlers and swag. 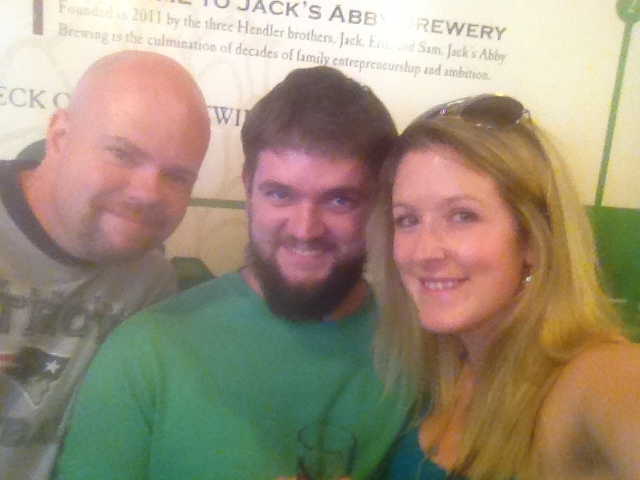 The first time we visited Jack’s Abby Brewing was with Mark’s brother Jason as well. 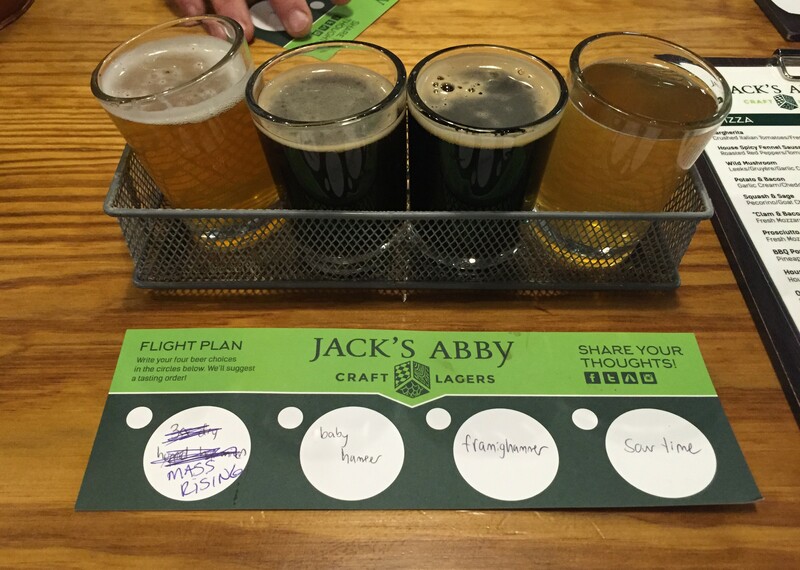 The guys had decided it was time to do a mini brewery and bar crawl through Framingham… Our visits included: Jack’s Abby, Angry Ham’s (featured on Bar Rescue), and John Harvard’s Brewhouse- Framingham. Old sign, and their old logo. 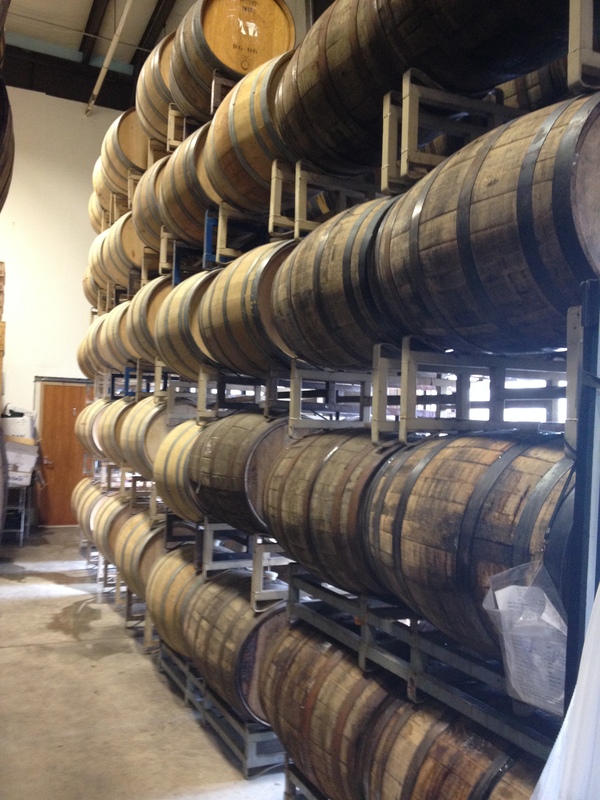 They also cask condition a lot of beers in Bourbon barrels as well as red and white wine barrels. 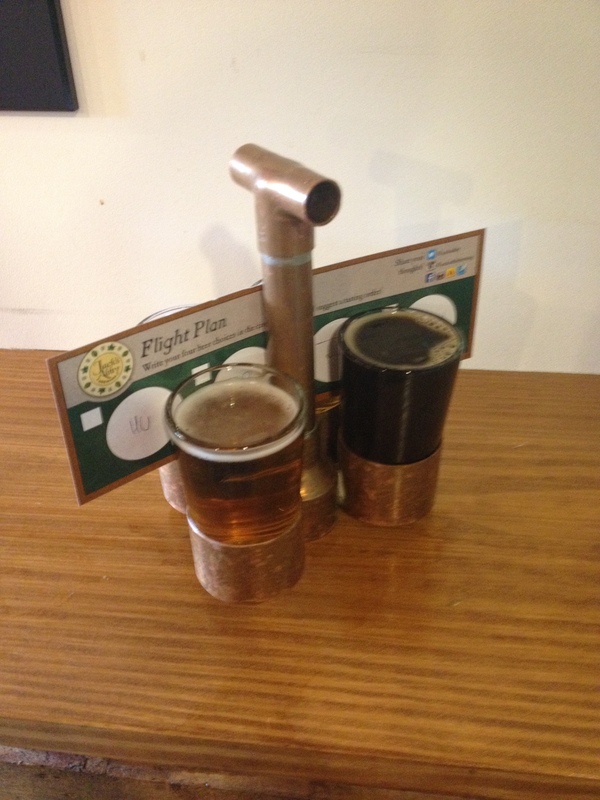 samplers before the tour- fun holder too! Everyone liked it, Mark thought it had a touch of fruit. 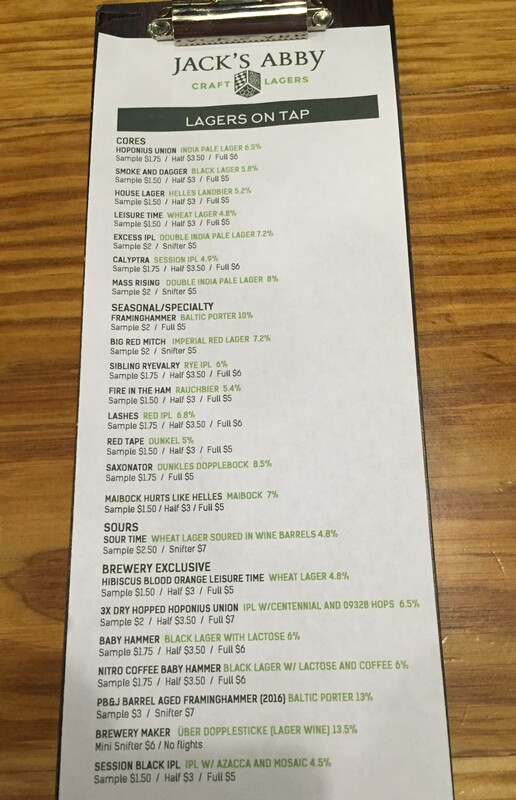 Really good mix of hops and lager. One of their flagship beers, one of Jason and Mark’s favorite. We buy this often, and didn’t bother tasting it in the most recent visit because we knew we were both buying some. Mark and Jason both thought it was a good summer beer. 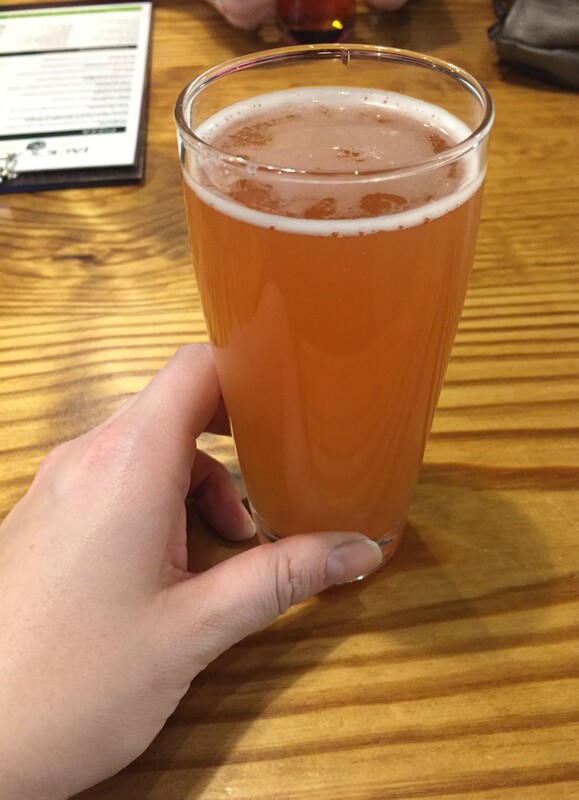 It’s what Megan likes, light and drinkable, citrusy. 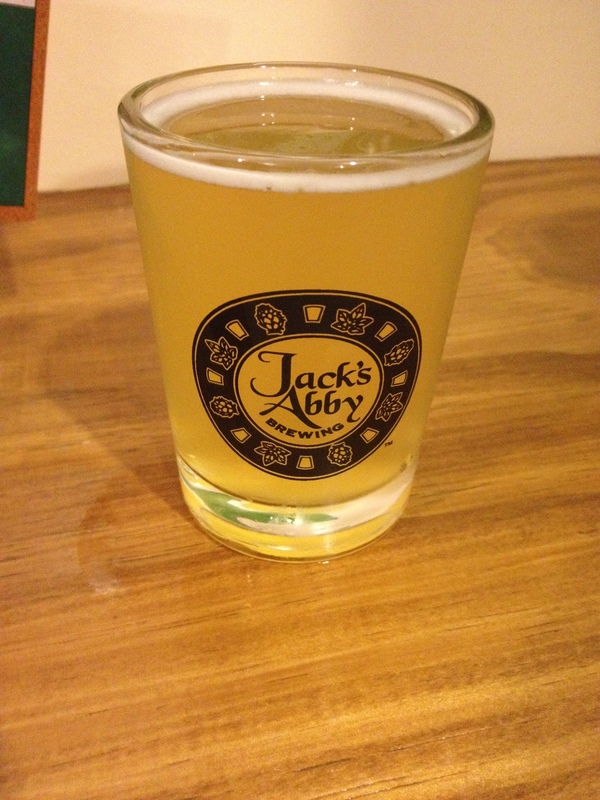 What Megan expected from a wheat sour, very good with a nice pucker. 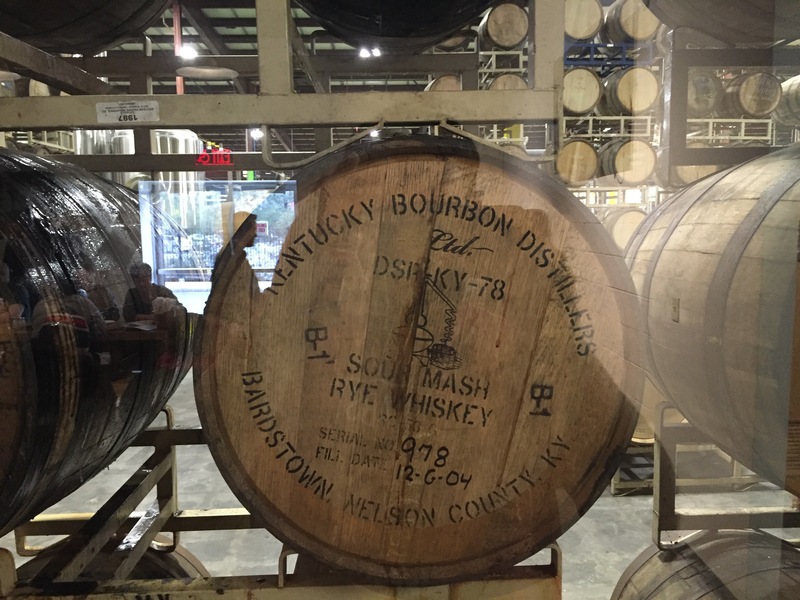 Although it was barrel aged, the bourbon taste surprised Megan. It did have a god balance of sour and cherries. Mark liked this better than the regular Berliner. Light, easy drinking, nothing too special, Jason agrees. Very strong taste, maybe a hint of brown sugar. Strong bourbon taste as well. Not as strong as the BA Framinghammer. Nutty with a little sweetness at the end. Made Mark smile when he had it, could get the PB & J taste, Jason thought it was more chocolate almond. Good taste, hops up front, smooth lager base. Mark and Jason both liked it. Jason liked it, so he shared it, everyone liked it. Definitely had a lighter, rye taste to it. 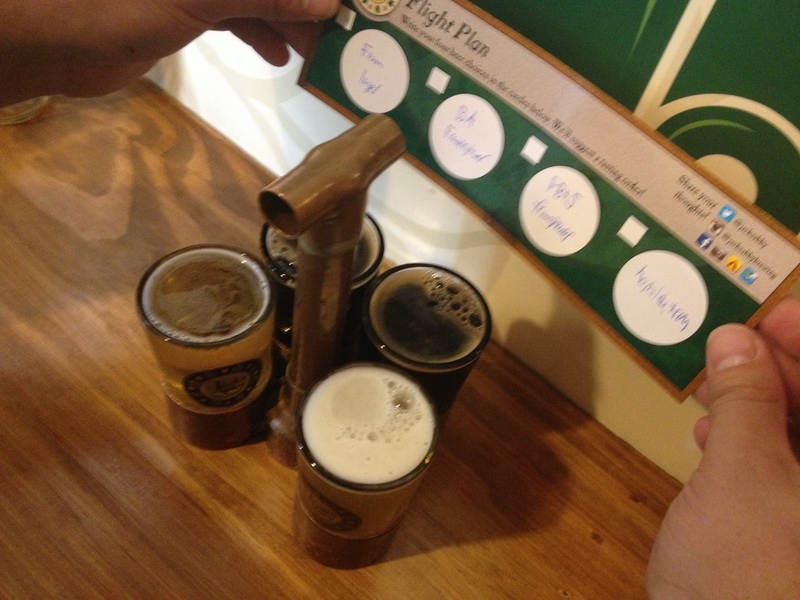 We had fun here, and we all found beer we liked, at the old brewery and the new one. 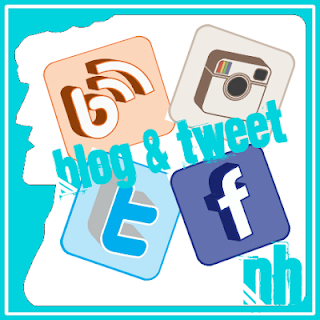 They also now distribute all over Mass, Connecticut, Rhode Island, Vermont, Eastern Pennsylvania and into New York as well. Not in New Hampshire or Maine, too bad for us. 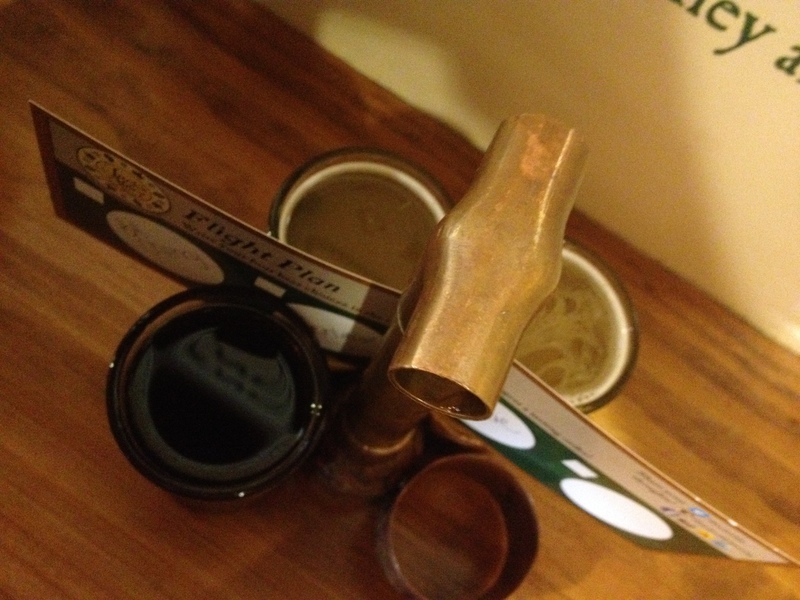 Pingback: John Harvard’s Brewery and Ale House, Framingham | Breweries, Wineries and the fun in between!